I have always believed whenever you are too full of yourself and your abilities life has a way of taking you down a notch and bringing you into balance. This evening was a classic example of this. Tonight, I decided to work through lunch so that I could get home and make a nice dinner for the babe. In the quietude that I experienced when I returned home (as Belle was at the sitter's house), I decided I would make crepes. The batter is fast. Of course, I forgot that you need let this batter rest for about 30 minutes. Having situated Belle with crayons and the giant pad of paper, I turned half my attention to turning out lovely crepes. They were turning out perfectly. Dinner would be done quickly and we could turn our attention to playing with my old TRON figures. I looked over with wonderment at the joy Belle was experiencing drawing with crayons, and then turned back to making a few more crepes. Looking back with joy at my sweet daughter, I watched as she grabbed a bag of cherry tomatoes (fresh from the CSA). Then we began to reenact a silent movie--me running, her running, tomatoes popping, me pleading, her laughing, me scolding, her crying. On a happy note, the herb crepes, filled with garlic sauteed veggies (potatoes, zucchini and green beans) were a big hit with mom and baby. Now, I have to finish cleaning the tomato seeds from the woodwork. I think I've seen this silent movie a few hundred times too. 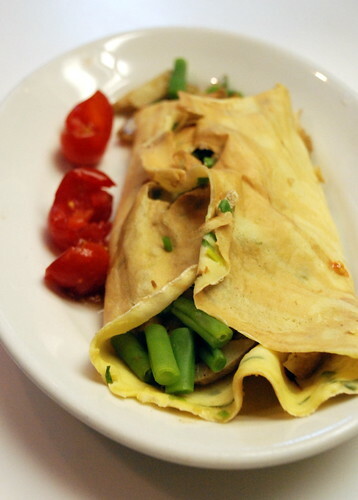 Well, inspite of everything, the herbed crepes look elegant, dainty, and delicious. Oh, nooo... We have had the same movie playing in our house many times. The crepes look gorgeous and delicious. 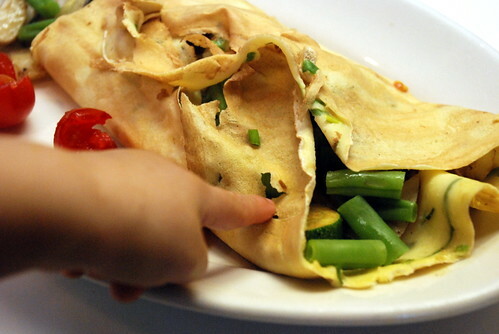 Crepe dinners were always my favorites growing up. this reminds me how much i absolutely love crepes! i will have to make some soon! Oh boy do I know all about that. My two year old loves to come up and "help" me in the kitchen.. IIIIIIIIIIIII it can be disastrous and scary sometimes. Then when I scold her I feel so bad afterward. Such is a Moms plight, huh. The crepes are so lovely and delicate. Never had veggies inside a crep and sounds superb! oh that's such a wonderful family moment ... it must be gr8 to be able to spend that quality time with ur kids. 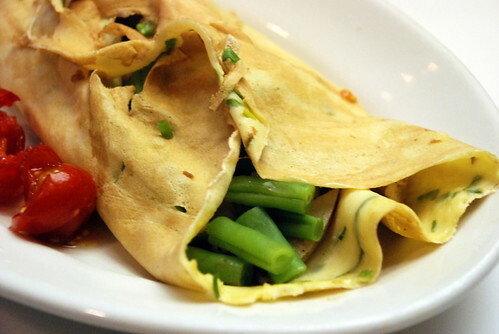 These healthy crepes look nice. [eatingclub] vancouver || js: it is a funny movie. no? Alexa: Oh, it is a movie that plays in my house everyday. Sophie: I will remember to keep my woodwork covered if you ever visit. Kate / Kajal: I am very lucky; I agree. Just when you think you are superwoman! But your crepes look amazing, I can never get mine so thin and perfect. They look gorgeous! It's great that you're feeding Maybelle such healthy food! Foodycat: you know, it is just practice. much like making dosas.